I have been thinking around the subject of photography pricing as it’s something that comes up regularly on my photography workshops and 1-2-1 mentoring sessions. I wanted to share some of the learnings from my business, but also from working with other baby, child & family photographers. "My first observation is there is no “one size fits all” pricing model"
If you have attended training courses the photographer/ trainer may well have presented their pricing strategy (which is of course understandable), but I think it’s important to absorb this information and then go on to develop a model which works for you. So what do you need to consider when developing your pricing model? There are a number of factors that will help mould you pricing strategy, and I believe they fall into 2 key areas. 1. Factors which should DEFINE your overall pricing strategy (whether you are mass market, premium etc). 2. Considerations that should REFINE your final price & product offering, once your overall position is in place. a) Why you are in business? I mentor photographers who range from part time Mums and Dads who work to pay for family holidays, to full time photographers who generate the sole income for their household. From the beginning you need to be clear on WHY you are in business. From experience, even if you plan to run your business part-time, photography can start to creep into all areas of your life until you find yourself always with camera in hand and editing late into the night. If you are clear about WHY you are running your business it helps you to set boundaries so you can maintain some work/ life balance. b) Who you want to work with, and what are the implications of that decision? Customers choose photographer for many different reasons, but one important consideration is that your style of photography suits them. They may be very much into beautiful styled shoots at well-known (chargeable) locations, or be looking for more relaxed lifestyle images taken at home, to go into a coffee book. Using my business model as an example, I wish to work with like-minded families who I really enjoy spending time with. I look for families who love being outdoors and who are happy to let their children run and play. They tend not to worry too much about getting a little dirty or sitting on the floor to get the shot. I find if I really enjoy my shoot, and feel free to deliver my style and vision, the final images are much more likely to be what we would both hope for. If you are targeting a customer who is happy to significantly invest their time and money into a shoot, then it’s important to understand that you will also be expected to deliver a customer experience which goes above and beyond. Think of it like John Lewis – you know that they aren’t likely to be the cheapest but their customer services are exceptional. If you are targeting customers who are willing to invest heavily in photography, you also need to factor in additional time and investment in premium packaging, wall art samples etc. If you think about a brand like Gucci they will invest in high end magazines to advertise, present their products in beautiful packaging etc. Who you choose to work with also has a huge impact on how much you travel and how often you are away from home. If you plan to work at incredible locations, this often requires travel and staying overnight. It also means that you may need to make yourself available on bank holidays, weekends etc. Your price package will need to reflect this additional travel and time. Knowing how much it costs to run your business is incredibly important and this is where a CODB calculator can be very useful. 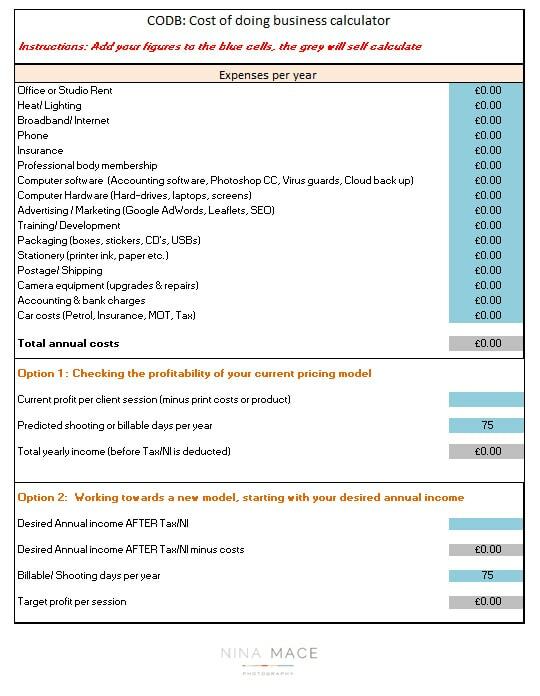 To plan well, you want to have a clear view on how much it costs to run your business, how many dates a year you aim to shoot, and how much profit you should make from each session. Once you have added in all your business costs you can do 2 things - first you can plug in your current pricing model and billable days per year to see what your approximate profit is likely to be. Second you can work backwards , starting with an annual income target to see what you need to charge per session to reach this. NOTE: When using this calculator it is very important to predict your billable days with some accuracy - look at how many sessions you currently average per week over the last 3 months to get started. So now you have a clearer view on WHY you are in business, who you would like to work with and worked out your target session pricing you can go on to refine the final offering. 1. Competitor pricing. Please note that I have NOT included this as a way to define your pricing, but instead it becomes a consideration once you have taken a view on your overall position. Once you have made a decision on who you want to target you then need to consider who else offers a similar product or service and understand your position in the local market. If you are the most expensive then you must tailor your product and service to match. Think about what you could offer that is unique and different to you. 2. Your skill set. I don’t often hear this mentioned in other pricing articles, but it is something I want to tackle head on – your pricing should be influenced by your experience and skills. Yes, it is important to have a vision of what customers you want to work with and what your final pricing will be, BUT it is also important to understand where you are in terms of your growth and photography skills. If you overprice, you could potentially overpromise and under deliver (which is the last thing you want to do when growing a new business). By overpricing you also leave yourself in danger of not working enough to reach your income goals. Conversely, by under-pricing, you run the risk of working very hard but feeling demotivated as you are not delivering your target income. Price also influences peoples perception of your quality so significantly under-pricing can do more harm than good. I also do appreciate when I talk about assessing your own skill level, it is very difficult to look at our own work objectively. This is where a portfolio review with a mentor or through an established photography organisation (such as the Guild of Professional Photographers) is worth considering. 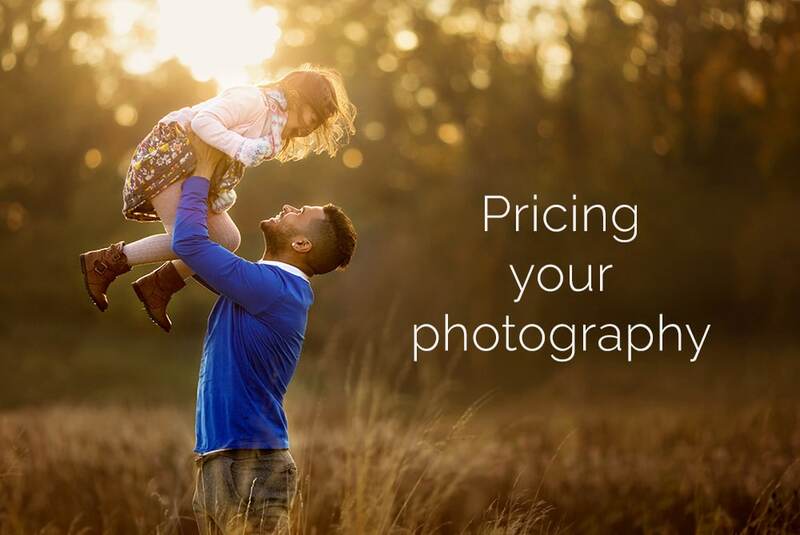 In conclusion, your photography pricing is a reflection of how you want your business and brand to appear - keep you at the heart of your business and you will likely reach your goals much faster. This was very useful. I am just looking to increase my prices and will definitely take this on board. Thank you ??? ?